I have taught courses in different levels (i.e., undergraduate and graduate students), content areas (e.g.,educational/developmental psychology, research methods), and modes of instruction (i.e., face-to-face and online). Based on my teaching experiences, and on my research findings, my teaching philosophy is that a classroom should be a space for students to develop their knowledge, explore and challenge their own ideas, and collaborate with their peers. I strive to realize this philosophy by supporting students’ mastery goals (i.e., aiming to understanding materials and developing competence) and encouraging peer learning. 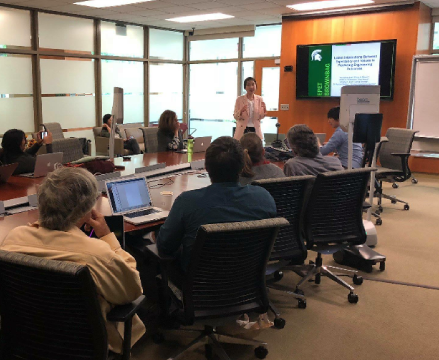 I taught a face-to-face undergraduate course in the Department of Teacher Education at Michigan State University for the last three years (2014-2017). In this course, I helped students understand not only what constitutes typical learning and development, but more importantly, the mechanisms that cause these changes. I also encouraged students to reflect on cultural issues in classrooms and discuss intercultural interactions related to teaching and learning experiences. "You-kyung was a wonderful instructor!!!" "Very well organized and engaging class discussion." "The instructor can give us deeper insights for us to think." "You-kyung was a very good teacher, and the course was also very interesting!" "You-kyung is a fantastic instructor and I feel like she really cared about our learning." "You-kyung was one of the best instructors I've ever had and made the class so enjoyable!" "This class was very well put together and I learned a lot from it. My professor was also exceptional." "I appreciate this course because I feel that I have learned many things. I enjoyed this course thoroughly! My instructor was amazing the class was amazing period. it was a great environment to learn in!" I worked as a teaching assistant for a doctoral course in Fall 2013. In this course, I introduced research methodologies and contemporary issues in educational inquiry. I worked as a teaching assistant for a master's course in Summer 2013. In this course, I helped students develop skills towards becoming a better consumer and producer of education research.